In April 2017, CARIS Onboard™ Product Manager, Travis Hamilton, was onsite with the Japan Agency for Marine-Earth Science and Technology (JAMSTEC) to conduct a CARIS Onboard installation and trial. JAMSTEC is an organization committed to supporting ocean research and development activities which covers a broad spectrum of marine science and technology. With several institutions located across the country, their mandate is to contribute to the creation of a holistic understanding of global concepts surrounding the ocean. While survey operations were managed from the R/V Yokosuka, CARIS Onboard and the survey sensors were installed on JAMSTEC’s AUV “URASHIMA” which is capable of deployment in depths of 3500m and allows for high resolution mapping in deep waters. The trial was organized to demonstrate how CARIS Onboard may be used to help improve efficiency for AUV surveys by providing quicker access to results, and supporting more efficient decision making around the redeployment or movement of the AUV to its next survey location. The trial began with installation and system familiarization on April 20th and 21st. 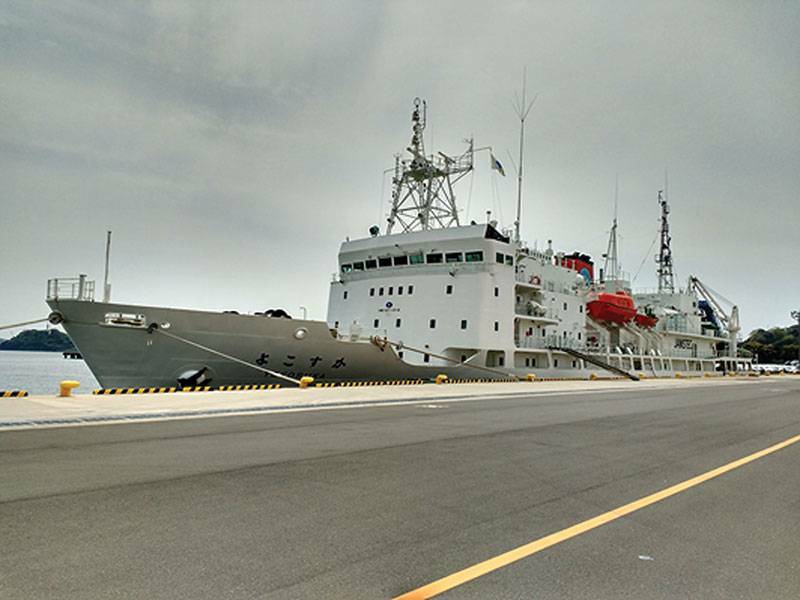 On the morning of April 22nd the vessel departed for the survey area in the Sagami-nada Sea. Following a three-hour transit, the AUV was deployed and dove to a depth of 1000m to conduct a trial survey to test all the vehicle’s sensors and systems, including CARIS Onboard. 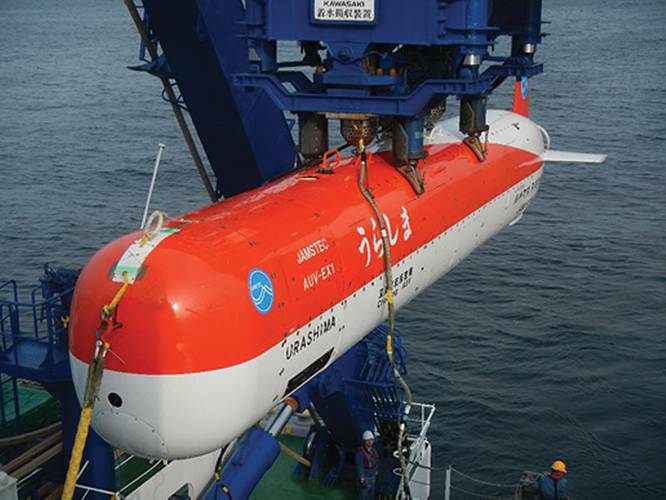 JAMSTEC’s AUV URASHIMA is designed for deep-sea exploration. The AUV is depth rated to 3500m and has a range of greater than 100km in a single dive. Due to its large size (i.e.1.3m wide and 10m long) URASHIMA has a payload capable of housing a large array of sensors. One of the sensors of interest for this trial was the Teledyne Seabat 7125 Multibeam Echosounder. Surveying at approximately 100m above the seafloor, the AUV can map an area of 5km2 at high resolution during a single deployment. Once URASHIMA has completed a mission, there is a standard set of procedures which are put into action to prepare it for its next dive. Once the AUV is recovered and secured to deck, the raw data collected by the multibeam is downloaded from the AUV to a processing station in the control room. 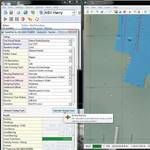 The data is then converted using HIPS and SIPS data processing suite, and processed into a point cloud and bathymetric surface. The processed products are then reviewed to ensure that the mission successfully surveyed the target area, and that the quality of the data met the survey requirements. 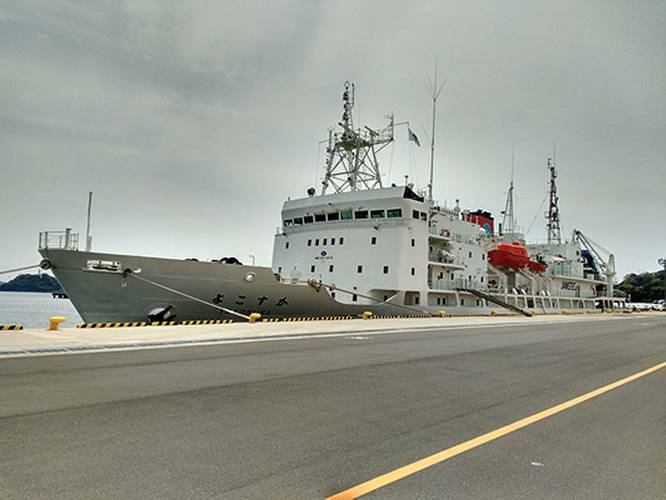 Once the survey coverage and quality of data has been reviewed, the decision can then be made to transit to the next survey location, or to redeploy at the current survey location to gather additional data. (The figure above shows the traditional timeline.) Given the size of the datasets, collected by URASHIMA, the time from the AUV being recovered to making a decision that the survey was successful is normally several hours. 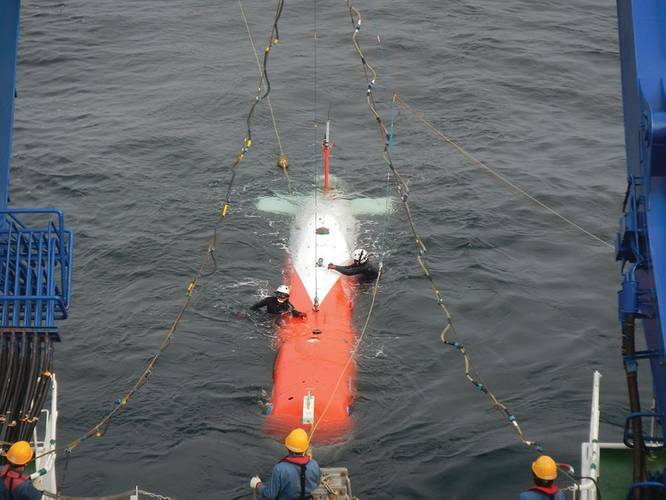 The goal of the trial was to demonstrate how CARIS Onboard could process the raw data and generate products automatically on the AUV while the survey was underway rather than after recovery, allowing for faster, and more efficient operational decisions which, in turn, reduces the overall survey time. Prior to the survey, CARIS Onboard was installed on URASHIMA and configured to process the raw sonar files from the multibeam as they were being acquired. A processing workflow was designed to import the raw sonar files into a HIPS project, apply sound velocity corrections, filter the attitude and soundings, and produce a georeferenced bathymetric surface. As soon as the AUV was recovered it was connected to the ships network, at which point the HIPS project, and processed surface could immediately be accessed from a laptop in the operations room. Within a fifteen minute window, a bad line had been identified by the data processor tasked with QC and was removed from the surface. With the bad line removed the data processor provided confirmation that the target was surveyed within requirements, allowing transit to the next survey location to commence. Using CARIS Onboard to process the raw sonar data on URASHIMA during the survey removed the time-consuming steps of downloading and processing raw sonar data from post survey procedures. This meant the time from recovering the AUV to being able to transit to the next survey location was reduced from several hours to just a few minutes, ultimately saving valuable ship time and operational costs, allowing the R/V Yokosuka and URASHIMA to operate together more efficiently. The trial also provided a unique opportunity to gain firsthand experience of the practical challenges of executing a deep-water AUV survey. This has resulted in practical software improvements in CARIS Onboard. One such example relates to pre-programming CARIS Onboard to ignore certain raw data files during processing. This capability would have eliminated the need to remove the erroneous line during QC in this trial. 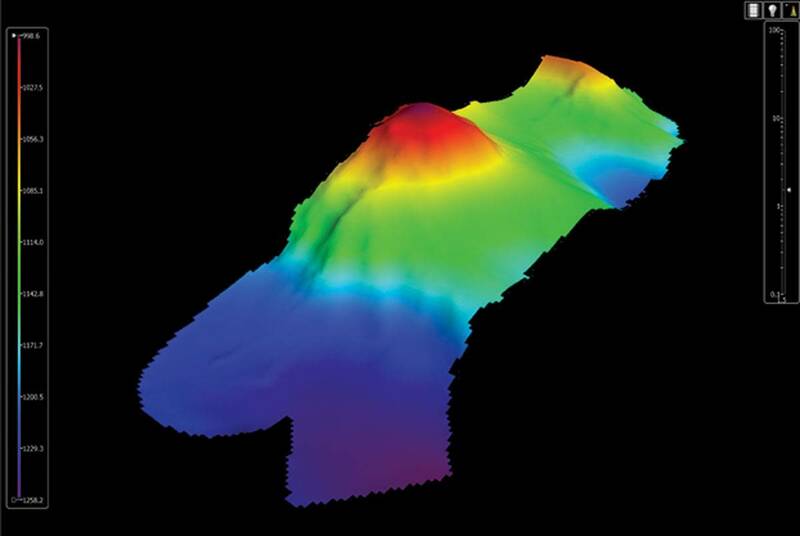 It was discovered that the multibeam is on and logging for the entire mission including the dive, and the recovery resulting in the collection of non-useful data. Based on this survey, a simple but powerful feature was added to CARIS Onboard to control which lines are submitted for processing based on the time they were collected. With this feature, JAMSTEC engineers can program Onboard to ignore sonar files collected during the dive and ascent, allowing only the survey lines to be processed. Going forward the data processors will no longer have to remove non-useful survey lines during QC gaining further efficiencies in their AUV survey operations. Travis Hamilton has been with Teledyne CARIS since 2015 and is the Product Manager for CARIS Onboard and HIPS and SIPS. Prior to this, he spent several years working in research and industry, gaining experience with the operation of, and processing data from, AUVs, subsea positioning systems and swath sonar systems. The implementation of autonomous technology in hydrography has seen steady evolution for 20+ years. The initial developments focused on deploying large diameter (0.5 to 1m) vehicles (AUV’s) at great depths. AUV’s have quickly proven to be cost-effective solutions for obtaining high resolution bathymetry, imagery and photographic images in environments where preceding technology fell short. The most recent innovation surge is focusing on autonomous surface vessels (ASV’s) where organizations have found great gains to be made by removing personnel from the vessel altogether. Since 1997, QPS has provided options for the user to minimize the interactions with the surveyor and the system by automating key functionality. The combination of QINSy’s automation and Qimera’s data processing innovations (Wilson et al., 2018) provides a tightly integrated solution for organizations to embark on this new era of Hydrography. 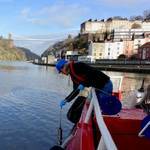 With tidal ranges up to 14m and extremely high sediment loads Bristol Port was an ideal location to test Valeport’s new SWiFTplus profiler with an integrated optical sensor, in this particular case turbidity.